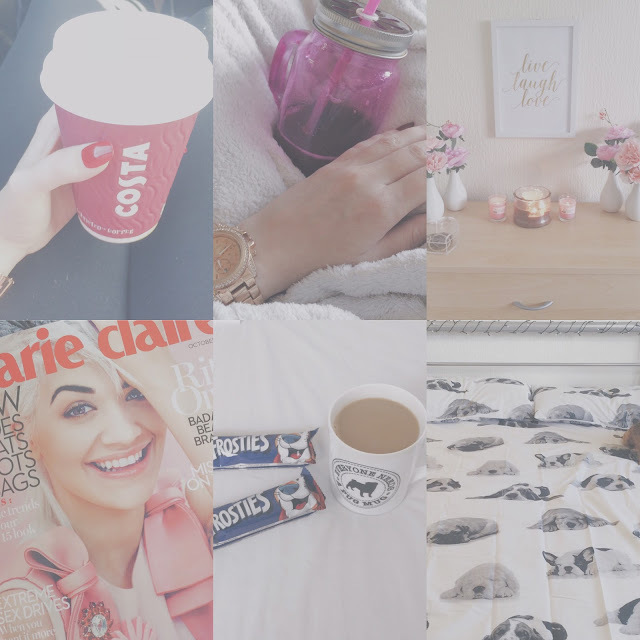 For today's blog post I thought I would just do a quick Instagram update of the last 6 pictures that I uploaded onto my blogs Instagram account, after you have finished reading this post if you would like to follow me over on Instagram then you can do so by clicking HERE to be taken to my blog account on there. 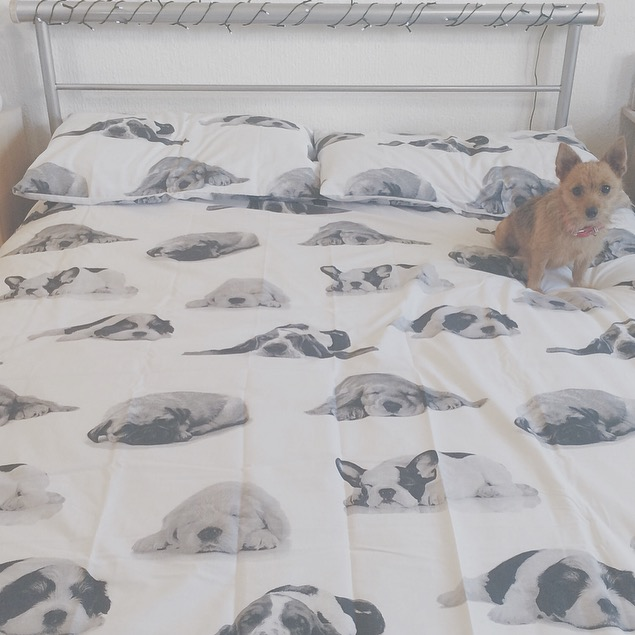 First up is this gorgeous duvet cover set with all sleeping dogs over it, the actual duvet is black and white there's no colour on it at all which I kind of liked. Being a dog lover this also attracted me to this particular bed cover haha, and as you may also have spotted my own dog Lana was feeling a bit left out so decided to jump up on the bed whilst I was taking the picture. This duvet cover I purchased from Asda's and it was £15.00 I think! 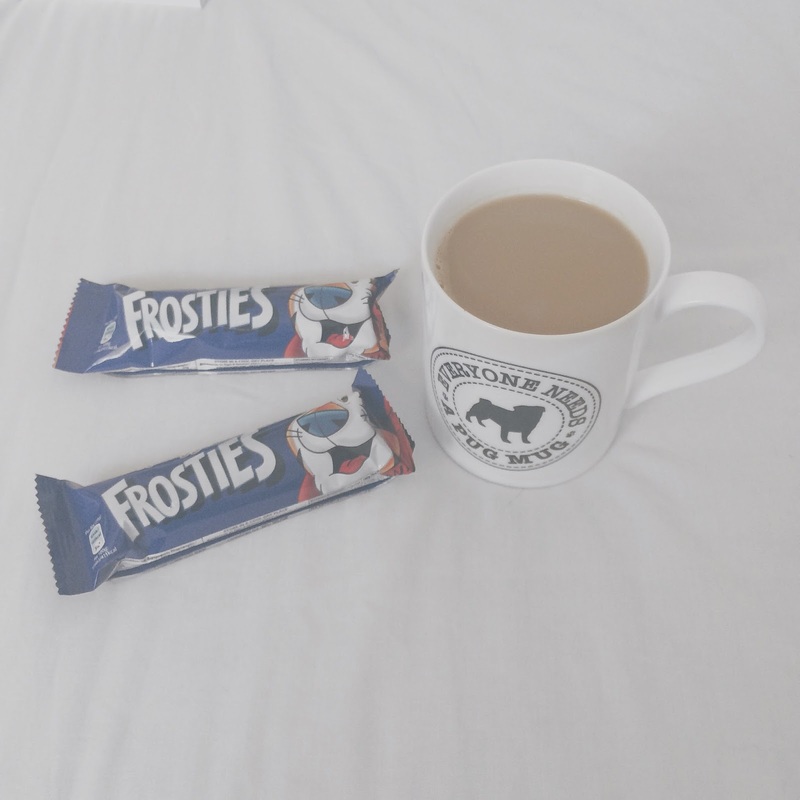 Next up this was a quick and simple breakfast for me, n this day I wasn't feeling too well and was feeling a bit sick but I knew that I had to eat something so I just chose 2 Kellogg's frostie bars and to be fair even those took me nearly an hour to eat haha. I also had a cup of coffee in my favourite "pug mug"....think that's gonna be the closest I'm ever gonna get to owning a pug lol. This is the finished look of one side of my bed, I've finally started to do my bedroom up to how I like it. 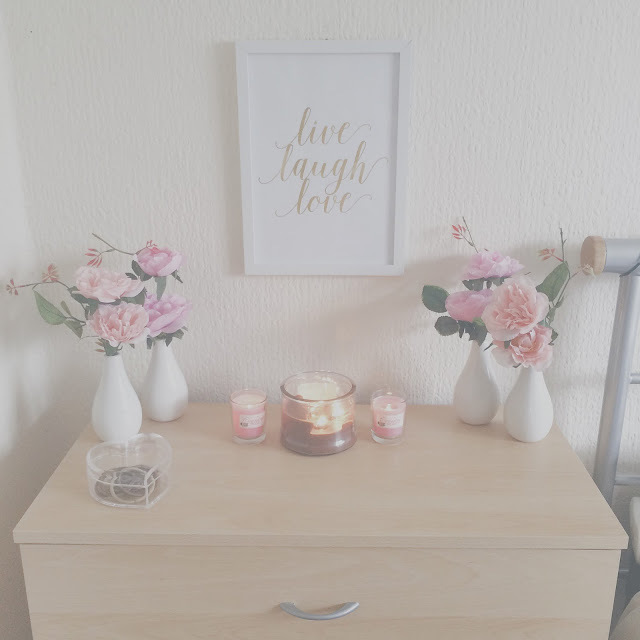 So I'm keeping everything simple and minimalistic, the artificial roses in white vases I picked up from B&M for just £1.00 each, the acrylic heart I got from the poundshop and just use that for hairband and hair grips and the candles are just ones I've had for ages. I'm trying to use all candles up that I already have before buying anymore, as at the moment I've loads of unused ones. This picture I was laying on the sofa with a really bad headache that I just couldn't get rid of (it ended up being a 5 day headache!). 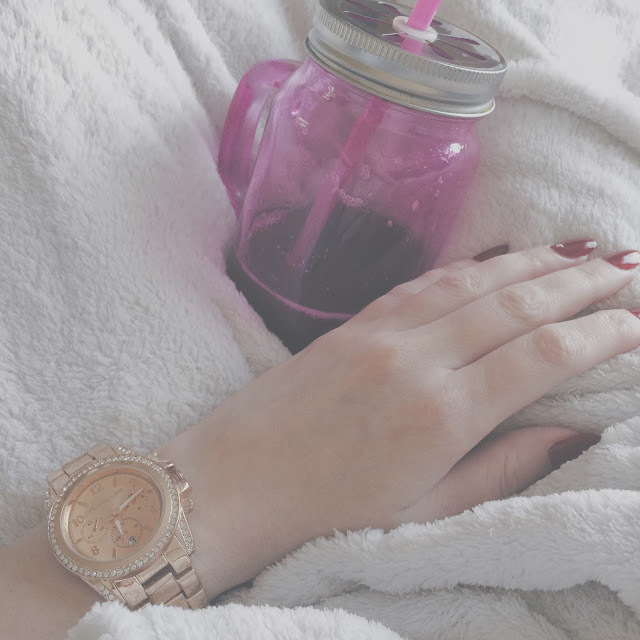 So I had a comfy fluffy blanket and poured myself a glass of red grape juice and just chilled out watching crap tv for a few hours, if your wondering why the red grape juice it helps ease of headaches although in this case it just didn't do that for me! 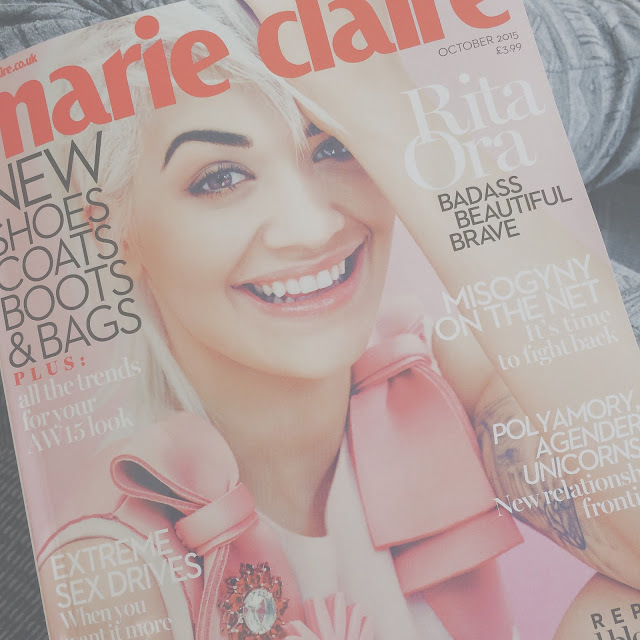 This is the magazine I'm currently reading, the new Marie Claire one. When I buy magazines it can sometimes take me weeks to fully read them for some reason, I can never just read a while magazine in one go. Magazines like this are also where I sometimes get inspiration for some of my blog posts. COFFEE!! Oh yes I do love a good coffee haha. 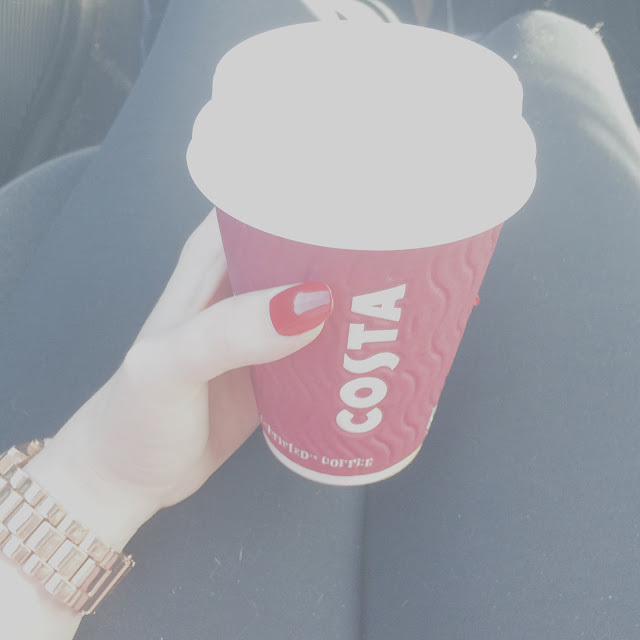 This is my latest Instagram post which I posted whilst on route to London in the car, we ended up stopping at Membury Services and got a coffee from Costa Coffee...was gonna go to Starbucks as I really want one of there Autumn coffee style cups that I keep seeing all over Instagram, but Starbucks was packed and we just wanted to get on with the journey. So there you have my latest 6 Instagram posts with a little insight behind the picture through a comment. I hope you liked them and I am definitely gonna start doing one of these kind of posts at the end of each month.